Miniature Horses: They’re as cute as a button shaped like a lady bug. 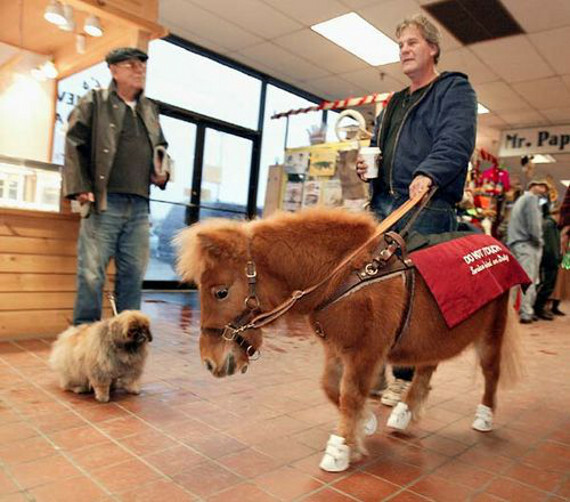 And these days, they (the miniature horses, NOT the lady bug buttons) are becoming more and more acceptable as service animals. A seeing-eye horse is ideal for those who are in need of animal assistance but suffer from dog allergies or phobias. The little guys who measure about 24 inches to 34 inches tall and only weigh 70 to 100 pounds tend to live longer than their K-9 counterparts. In the latest in equine-helpers news, the Illinois state Senate have been voted to allow them to provide assistance to those with disabilities. Now all we’ve got to do is get the opposite of a NEIGH by the House! I guess you could say that the ever-growing rights of the mini steeds is growing by leaps and bounds. Or trots and gallops.